OpenFaaS is a framework for building serverless functions through the use of containers. As an open source project, it has gained large-scale adoption within the community. This document details installing and using OpenFaas on an Azure Kubernetes Service (AKS) cluster. An Azure Kubernetes Service (AKS) cluster and AKS credentials configured on your development system. OpenFaaS maintains its own helm charts to keep up to date with all the latest changes. As a good practice, OpenFaaS and OpenFaaS functions should be stored in their own Kubernetes namespace. You can get the value of the secret with echo $PASSWORD. The password we create here will be used by the helm chart to enable basic authentication on the OpenFaaS Gateway, which is exposed to the Internet through a cloud LoadBalancer. A Helm chart for OpenFaaS is included in the cloned repository. Use this chart to deploy OpenFaaS into your AKS cluster. A public IP address is created for accessing the OpenFaaS gateway. To retrieve this IP address, use the kubectl get service command. It may take a minute for the IP address to be assigned to the service. To test the OpenFaaS system, browse to the external IP address on port 8080, http://52.186.64.52:8080 in this example. You will be prompted to log in. To fetch your password, enter echo $PASSWORD. Finally, install the OpenFaaS CLI. This example used brew, see the OpenFaaS CLI documentation for more options. Set $OPENFAAS_URL to the public IP found above. Now that OpenFaaS is operational, create a function using the OpenFaas portal. 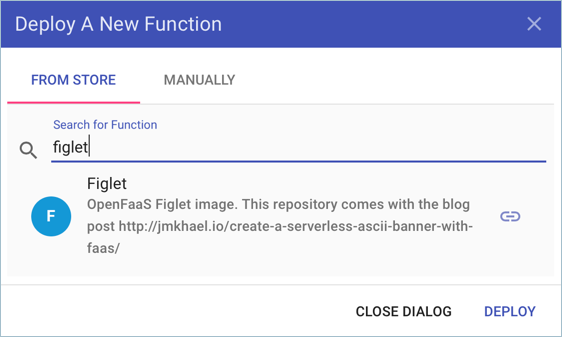 Click on Deploy New Function and search for Figlet. Select the Figlet function, and click Deploy. Use curl to invoke the function. Replace the IP address in the following example with that of your OpenFaas gateway. curl -X POST http://52.186.64.52:8080/function/figlet -d "Hello Azure"
Now create a second function. 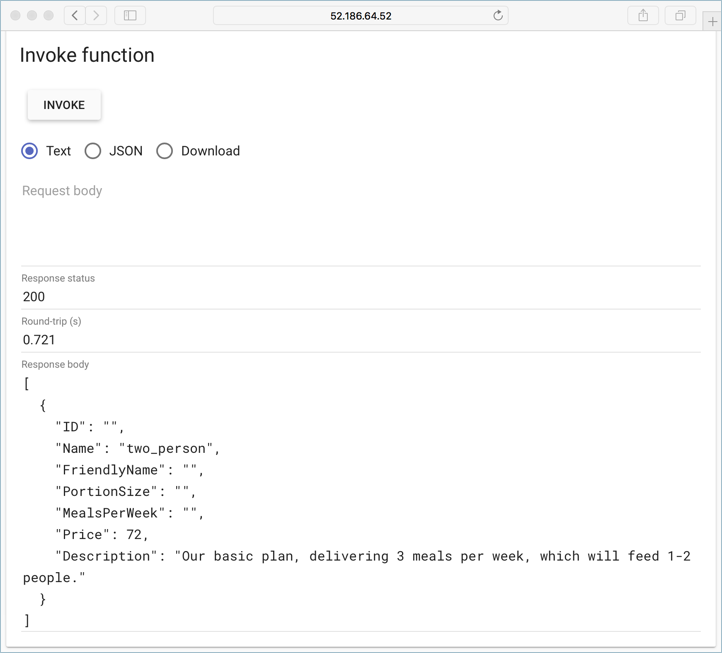 This example will be deployed using the OpenFaaS CLI and includes a custom container image and retrieving data from a Cosmos DB. Several items need to be configured before creating the function. First, create a new resource group for the Cosmos DB. Deploy a CosmosDB instance of kind MongoDB. The instance needs a unique name, update openfaas-cosmos to something unique to your environment. Get the Cosmos database connection string and store it in a variable. Update the value for the --resource-group argument to the name of your resource group, and the --name argument to the name of your Cosmos DB. Now populate the Cosmos DB with test data. Create a file named plans.json and copy in the following json. Use the mongoimport tool to load the CosmosDB instance with data. If needed, install the MongoDB tools. The following example installs these tools using brew, see the MongoDB documentation for other options. Run the following command to create the function. Update the value of the -g argument with your OpenFaaS gateway address. Once deployed, you should see your newly created OpenFaaS endpoint for the function. Test the function using curl. Update the IP address with the OpenFaaS gateway address. 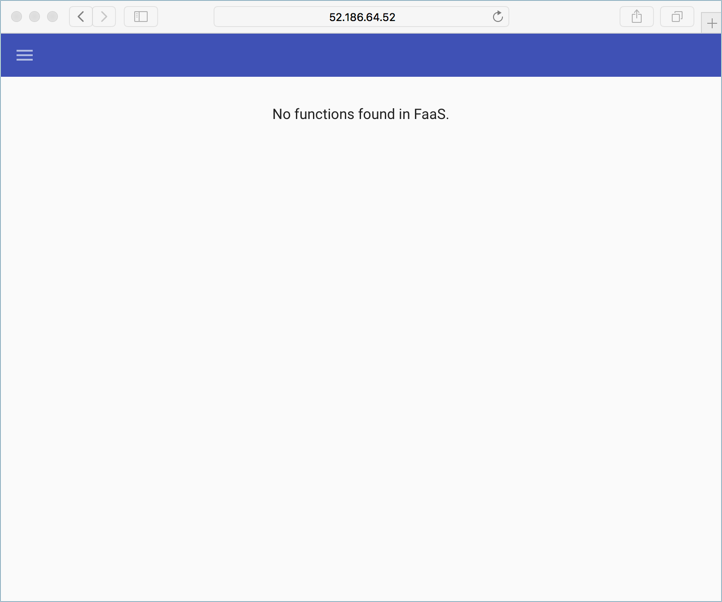 You can also test the function within the OpenFaaS UI. You can continue to learn with the OpenFaaS workshop through a set of hands-on labs that cover topics such as how to create your own GitHub bot, consuming secrets, viewing metrics, and auto-scaling.